Illiterate construction labourer Rajesh Parmar (in yellow), 25, waits for work with about 2,000 others in one of 50 labour markets in Gujarat’s capital, Ahmedabad. He moved here from Dahod, 200 km to the east, in search of a stable job about seven years ago. Until demonetisation, he generally charged Rs 400 per day and earned around Rs 12,000 per month. Now, he accepts Rs 200 per day. 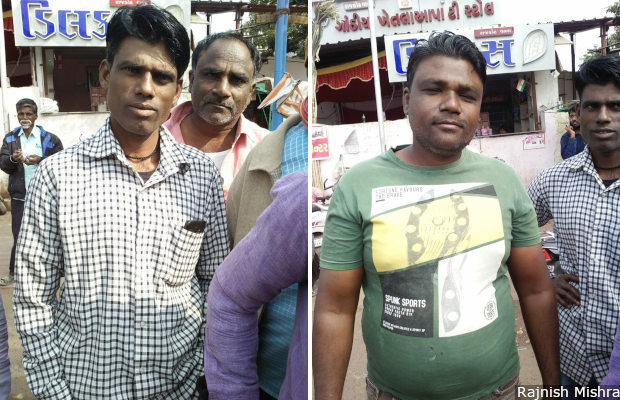 Ahmedabad: “We don’t know when this misery will end.” It was two weeks since brothers and college dropouts Rajendra (33) and Devendra Chunara (34) had found work. Their slouched shoulders, tired eyes and worried faces betrayed their frustration. Every day at 8 am, they stand with about 2,000 daily wage workers -- either in groups on the side of the road or, when they tire, sitting on the divider -- hoping to be hired for construction sites, loading, plumbing, electrical, anything. At the Akhbar Nagar circle -- one of the largest of about 50 labour hubs in India’s 5th most populous city in its 13th-richest state by per capita income -- they wait for labour contractors to offer them a job or swarm any vehicles that slow down. About half are locals, the rest from poorer states such as Uttar Pradesh, Bihar and Rajasthan, the workers told IndiaSpend. “We don’t know when this misery will end.” It has been two weeks since brothers and college dropouts Rajendra (33, left) and Devendra Chunara (34, right) found work. Before demonetisation, they each earned Rs 10,000-Rs 15,000; that is now down to Rs 3,000-Rs 5,000 per month each. Before Prime Minister Narendra Modi’s demonetisation programme invalidated 86% of India’s currency overnight in November 2016, the Chunara brothers each earned double of what they do now: from Rs 10,000-Rs 15,000 each, their monthly income is now Rs 3,000-Rs 5,000 per month each. Before demonetisation, the brothers worked 25 days a month. Now, they work for five to 10 days. Other workers around the brothers confirmed these data. As Nobel laureate Paul Krugman warned India of mass unemployment, and a leaked government report revealed that the male workforce shrank by 18 million over six years to 2018, the brothers said they were living through their “worst time” in 10 years, and had never seen so much unemployment. The “main reason” for the lack of jobs for labourers was demonetisation, which “severely impacted” Gujarat’s largely cash-driven construction sector, the second-largest contributor to its economy at 10%, behind only agriculture (22%), said Ashish Patel, chairperson of the Gujarat Institute of Housing and Estate Developers, a not-for-profit body of realtors. This is the fourth of an 11-part series (you can read the first part here, second part here, and the third part here), reported from nationwide labour hubs--places where unskilled and semi-skilled workers gather to seek daily-wage or contract jobs--to track employment in India’s informal sector. This sector, which absorbs the country’s mass of illiterate, semi-educated and qualified-but-jobless people, employs 92% of India’s workforce, according to a 2016 International Labour Organization study that used government data. By delving into the lives and hopes of informal workers, this series provides a reported perspective to ongoing national controversies over job losses after demonetisation and a transition to the Goods and Services Tax (GST) regime. The number of jobs declined by a third over four years to 2018, according to a survey by the All India Manufacturers’ Organisation, which polled 34,700 of its 300,000 member-units. In 2018 alone, 11 million jobs were lost, mostly in the unorganised rural sector, according to data from the Centre for Monitoring Indian Economy (CMIE), a consultancy. In November 2016, as demonetisation was announced, Gujarat’s unemployment rate was 2.2%, according to CMIE data, rising to 5% in December 2016, 9.5% in February 2018 and 7.4% by October 2018. As of February 2019, the unemployment rate in Gujarat was 5.5%. No official comment was forthcoming, but the state government does not accept that demonetisation either affected Gujarat’s economy or shrank the job market, a labour department official said on condition of anonymity, given the sensitivity of the subject. As a consequence, there is no specific support for jobless workers. Hard times first visited the Chunara family a decade ago, when a family financial crisis--caused by the failure of their father’s little farm--forced Rajendra to drop out of second-year electrical engineering and Devendra from second-year B. Com and join Gujarat’s informal labour force. Their wives do not have jobs, their children attend primary school, and they live in rented houses in Vaddaj, a short walk from the bustling market square, situated between two busy roads. Almost 70% of workers in Gujarat’s informal sector are below 40 years of age, said Ramesh Shrivastav, secretary of Mazdoor Adhikar Manch, an NGO working for the rights of labourers in construction and other unorganised sectors. Struggling to pay for basic amenities such as rent and school tuition, the Chunara brothers said “more than 70%” of their fellow daily-wage labourers were forced to take loans from moneylenders who charge “hefty” interest, ranging from 10% to 20% per month. We found similar experiences voiced by daily-wage workers waiting at labour hubs across the city in Ghatlodia, Sabarmati, Chandlodiya, Shahpur, Narol, Nehru Nagar, Sarkhej, Vasna and Memnagar. Most blamed demonetisation on the current state of unemployment in Gujarat’s unorganised sector. While there is not as much work as before, there are more who wait for jobs, they said. The government does not even try to find out how many look for temporary jobs. “The workforce in the unorganised sector is so huge, it is not possible to get the numbers tabulated through any survey,” said deputy labour commissioner Shrutiben Modi. “The government is trying to get more and more of them registered under various boards and welfare schemes.” She said an estimated 83% of the state’s workforce is in the unorganised sector, nine percentage points lesser than the national average. The number of daily-wage workers waiting daily across all the major labour hubs in this industrial city is around 100,000, said Minaben Jadav of the Centre for Labour Research and Action, an NGO working for labour rights in Gujarat. Skilled and semi-skilled labourers earn around Rs 800 per day, while the unskilled--the largest section of the crowd at Akhbar Nagar circle--said they were lucky if they got Rs 400 a day; it was usually half that amount. After waiting the entire day at Akhbar Nagar circle, Rajendra and Devendra found no work. Defeated, they packed up their tiffin boxes and headed home -- in the prime of their working lives, with no work and no prospect of improvement. Gujarat’s construction sector was seeing a “slump due to economic slowdown” before demonetisation, and it “virtually stopped [working]” post the note-ban, which has led to unemployment and labour loss, said Balbir Singh Khalsa, the Ahmedabad branch manager of Knight Frank LLP, a global property consultancy. The arrival of the Real Estate Regulation and Development (RERA) Act in 2016 and the GST in June 2017, widely criticised for its hasty, often chaotic implementation, further “hit the market”, Khalsa said. Between 25,000 and 30,000 new flats were launched in Ahmedabad every year, which “tumbled” to 15,000-16,000 even before demonetisation because of the lingering effects of the worldwide 2008 downturn. Over the last two years--after demonetisation, RERA and GST--no more than 2,000-4,000 units per year were built. This slowdown has made the lives of construction workers at the bottom of the labour pyramid especially hard. At Akhbar Nagar circle, illiterate construction labourer Rajesh Parmar, 25, dressed in a bright yellow shirt, looked ill and exhausted. He had just recovered from a bout of fever. About seven years back, he had moved to Ahmedabad from Dahod, 200 km to the east, in search of a stable job. Until demonetisation, he generally charged Rs 400 per day, earning around Rs 12,000 per month, and could find at least 25 days of construction work. Now, he accepts Rs 200 per day. On a monthly income of Rs 4,000 to Rs 6,000 for eight to 12 days of work in a month, he pays Rs 2,000 as rent for a hut in a slum-like neighbourhood that has no running water or toilet; he and other labourers travel more than 2 km to find water each day. His wife, too, is illiterate and a daily-wage labourer, earning about Rs 4,000 a month. Both cycle 2 km to Akhbar Nagar circle. Sometimes they walk, while their three little children ride along on the cycle to work. “Life was very tough for us, and in these times when we don't have much work, it has become even more difficult,” said Parmar. Shrivastav of the Mazdoor Adhikar Manch estimated that Gujarat currently had 1.2 million labourers, even though the latest available official data (2017) with the Building and Other Construction Workers (BOCW) welfare board puts the number at 532,895. A quarter of construction workers are women, he said. Leelaben Makwana, 60 and illiterate, is a fixture at Akhbar Nagar circle in Ahmedabad. She sits on the road divider with the weariest labourers. “The situation has worsened after notebandi [demonetisation],” she said. Makwana now finds work on about six to 10 days a month, down from 20 before demonetisation, and her wages have dropped by half to Rs 200 per day. Leelaben Makwana, 60 and illiterate, personifies these women. Makwana’s husband died 10 years ago, and since then, she has been a fixture at Akhbar Nagar circle. Dressed in an old printed saree, she sat on the road divider with the weariest labourers. Her stress over the lack of jobs and declining income was compounded by the fact that her son (37) and daughter (35) were not married. 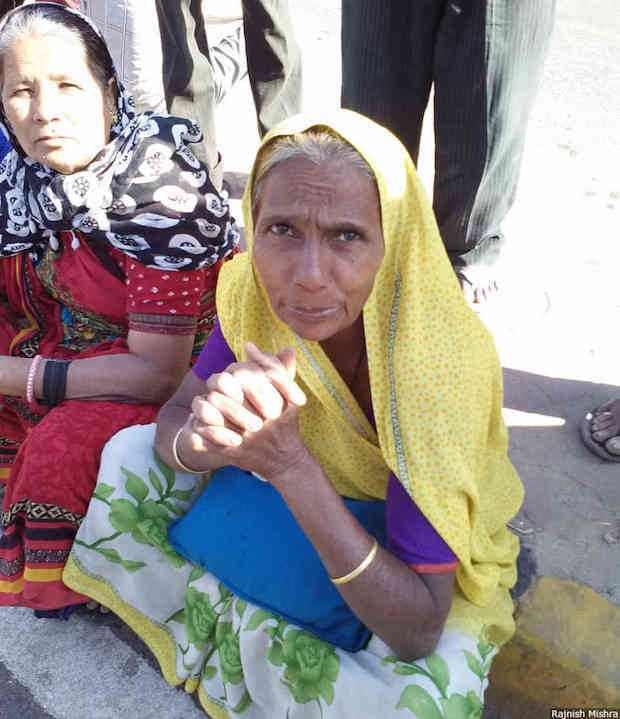 Makwana’s son earns Rs 7,000 per month as a worker at a private garage, while her daughter is a house maid, earning between Rs 5,000 and Rs 7,000 per month. Makwana earns between Rs 2,500 and Rs 5,000 per month. “The situation has worsened after notebandi [demonetisation],” said Makwana, who now finds work on about six to 10 days a month, down from 20 before demonetisation; her wages have dropped by half to Rs 200 per day. Like Leelaben Makwana, 45-year-old Hansaben Sumera, said notebandi had led to a “dire unemployment crisis” in Gujarat. Dressed in a yellow-and-white printed saree and looking forlorn, she, too, had lost her husband 10 years ago and had been coming to the Akhbar Nagar labour hub ever since to find a construction job. Sumera earned almost Rs 10,000 per month before demonetisation for between 20-25 days of work; her earnings have dropped to less than Rs 5,000 a month now, and she finds work on eight to 12 days. Her younger daughter, a domestic workers, earns Rs 3,000 a month. “I really don’t know when things will improve,” said Makwana. The real-estate industry hopes for a turnaround in 2019. Khalsa of Knight Frank is “hopeful” the slump in Gujarat’s real-estate industry will improve by Diwali of 2019. About 200,000 people migrate to Ahmedabad from rural Gujarat and elsewhere every year, said Khalsa. More buildings will be built, and “this, in turn, will increase demand for labourers”. Further, said Patel of the Gujarat Institute of Housing and Estate Developers, other issues that caused a real-estate slump are being resolved, including GST regulations, RERA laws, regulations related to the Gujarat Comprehensive Development Control Regulations (related to building permissions, fixing a building’s height, fees, etc.) and the Online Development Permission System (a digital application for project queries). Meanwhile, the BOCW board said it was attempting to boost existing welfare schemes for registered workers, including a death compensation of Rs 300,000 and permanent disability compensation of Rs 150,000. “We have sent a proposal to the state government to increase these two figures to Rs 400,000 and Rs 300,000 (respectively),” said BM Prajapati, member-secretary of the BOCW welfare board. This is the fourth of 11 reports. The previous stories from: Indore, Jaipur and Perumbavoor. In nutshell, the argument is that the construction sector in Ahmedabad was already slowing down and demonetisation hastened the process. At the very best, it appears as a conjecture since no analysis is offered to understand the rate of decline in construction activity pre- and post-demonetisation. Just to understand the construction sector a little better in Ahmedabad (just like many parts of Gujarat), when a buyer purchases a house, he/she is asked by the builder to pay Jantri (value of house determined by the state government) in the form of white money. However, the actual value of house is much higher than Jantri and the buyer has to pay remaining money in cash. This essentially becomes black money floating in the system. Typically the ratio of black and white money in such deals is 50:50. In the past, black money acquired through corruption was invested in the housing market. Although demonetisation brought all the cash back to economy, big hoarders had to pay up to 30% commission to secure their ill-gotten wealth. Hence, they are sitting on a smaller pile of cash, live under fear of being caught by income tax and also afraid of some other version of demonetisation in future. I believe, the fall in construction activity is a combination of natural decline (over supply against demand) and lesser money available to dump in real estate deals. This does have an impact on immediate jobs available to labourers. At the same time, it has allowed more white money to enter the economy. White money means more tax revenue for the government, which they are using to support labourers who are living below the poverty line. Sir, the “30% commission” itself is black money! It only changed hands and returned to market. “White money means more tax revenue for the government, which they are using to support labourers who are living below the poverty line.” This is not substantiated by facts. Inequality has grown exponentially. This is so distressing. The government must increase infrastructure spending to generate jobs in the construction sector, besides sorting out the problems caused by GST and other government measures so that private investment in the sector increases. The Gujarat BOCW Board should proactively register more workers and increase benefits like education allowance for children, maternity and sickness benefits and pension to older workers especially women. These are staged dramas before elections. Paul Krugman’s work was long back..concern was just before elections, is it? They must have some sense to talk during this time. After election dates are announced, whatever they cry cannot be taken for further action, which these people should know. Let them not pretend and create sensation. These pseudos should be exposed. Please get your facts right. Nowhere in Ahmedabad daily wage unskilled labour is available below Rs 350 per day plus fare plus 2 times chai and one hour lunch break. 9 am to 5 pm. Skilled labour wages could be as high as Rs 1,000 per day. Actually, labour contractors were paid in advance by realtors to get rid of old notes. Please do your home work before writing an article. The article gives links to the previous 3 articles. (This is the fourth of an 11-part series (you can read the first part here, second part here, and the third part here). Thanks for pointing out the wrong link. We have updated it with the correct link. This story appears to have been written with a biased mind. A lot of unaccounted money flows into many businesses.. it is known to all. For a small job, if one needs a carpenter or a plumber or an electrician, one has to pay Rs 300-700 a day. During festive season like Holi and Diwali, one don’t even get workmen or labourers for months together. The other side of the coin may be that labour contractors also exploit such workers. The minimum wage of an unskilled worker determined by the government is Rs.18,000 per month. That is Rs. 600 a day. If a carpenter earns Rs. 700, he is entitled to it. Also, the fact is he cannot not earn this much everyday. sometimes Rs.300 and sometimes Rs. 1200. If his daily average is Rs. 600 he is managing just at subsistence level. Very important for the common man by highlighting the state of his standard of living and difficulties. Your coverage is 100% true. An engineering graduate with experience is called on a freelance basis. The Indian job market is making life hell for even educated people.